How does Bowdoin spend its money? In recent months there has been a pattern of stories in the Orient exploring the complexities and limitations of Bowdoin’s endowment and operating budget. 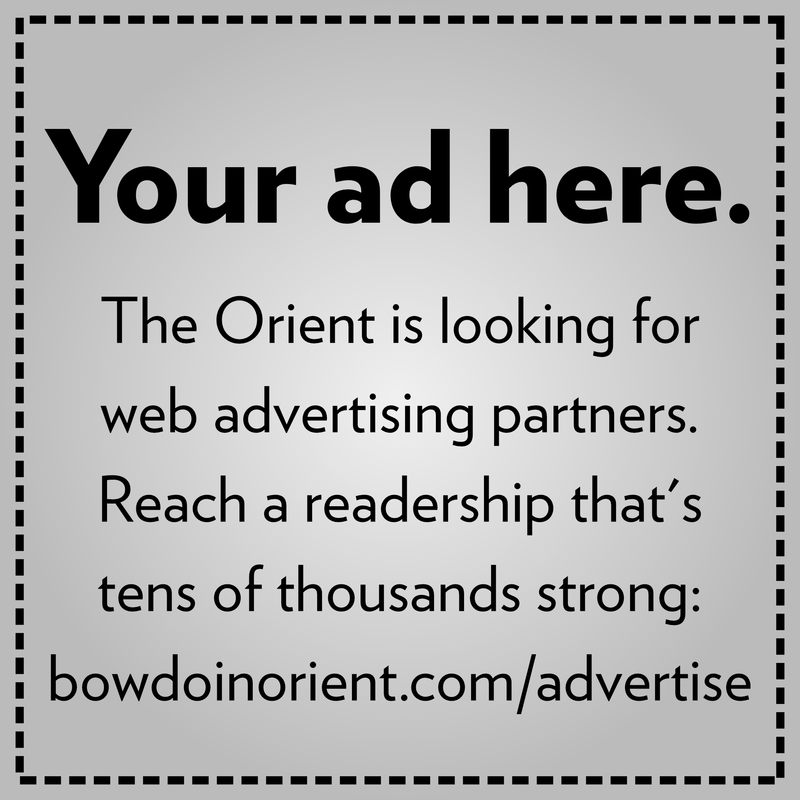 To add context to the series of articles and op-eds, the Orient has decided to break down the numbers behind the money that makes Bowdoin run. This is Part 2 of a two-part series examining Bowdoin’s budget. Part 1 examined the College’s sources of revenue. This week, we look at its spending. Bowdoin has 1,828 students, 95 buildings, 376 administrators, 373 support staff, more than 200 faculty, 24 academic departments, eight academic programs, two dining halls and one taxidermied polar bear. Maintaining the College as we know it costs money—about $168 million for this academic year. Data from the Office of the Treasurer explain how this money is spent across campus and beyond. Most of Bowdoin’s money is spent on people—65 percent of the operating budget goes toward salaries and benefits for the College’s roughly 940 full-time equivalent (FTE) employees. Salaries total $80 million each year, while health and retirement benefits come to roughly $28 million. The $80 million in total salaries is divided among about 200 faculty members, 368 administrators and 372 members of support staff. 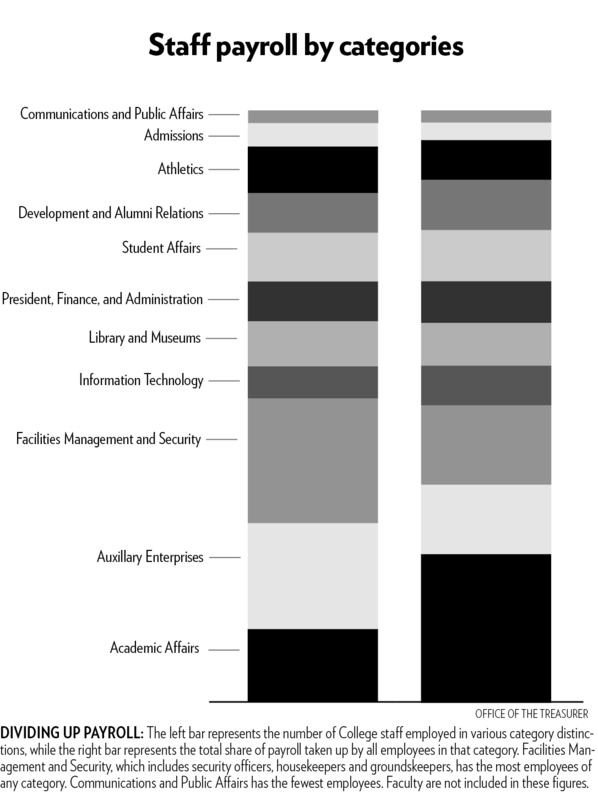 Faculty and administrators are salaried employees, while support staff are paid hourly. Faculty payroll was $27.6 million for the 2018-2019 academic year. Bowdoin pays its faculty more than the average four-year private college. According to data published by the Chronicle of Higher Education, assistant professors at Bowdoin, on average, made $82,499 for the 2017-2018 academic year, compared to an industry average of $75,529. Bowdoin’s average salaries for all professor ranks (assistant, associate and full) exceeded those of any other college in Maine. Not all faculty are compensated equally. Faculty salaries, like others at the College, are based on market wages, so professors in high-demand fields such as computer science might be paid more than their colleagues in less marketable disciplines such as history. Bowdoin increases faculty payroll each year based on average raises over the past three years at comparable colleges. Staff payroll is divided into 11 functional categories. Facilities Management and Security, which includes housekeepers, groundskeepers and security officers, has 18 administrative staff and 144 support staff—the most employees of any functional category. Payroll for these employees totals $10.4 million for the 2018-2019 academic year. The category with the second-most employees is Auxiliary Enterprises, which includes Dining staff and store employees. There are 20 administrative staff and 115 support staff under this category, and total payroll is $9.1 million. The remaining nine categories all have more administrative staff than support staff. The category President, Finance, and Administration, which includes the President’s Office, the Treasurer’s Office, the Controller’s Office and Human Resources, has 31 administrators and 11 support staff and a total payroll of $5.8 million. In addition to payroll for faculty and staff, the College spends about $1.4 million on casual labor, such as seasonal workers for summer programs, and $2.6 million on student labor. Health and retirement benefits are available for all Bowdoin employees who work at least 20 hours per week. The College budgeted $12.8 million for healthcare costs this year, though the amount it actually spends varies based on the health needs of its employees each year. Employees choose from three healthcare plan options, which have different monthly contributions, copays and deductibles. The monthly contribution that each employee pays toward a healthcare plan varies based on salary. For example, an employee who makes less than $43,000 and is also covering a spouse’s health care pays $398 per month for a PPO Health Plan, while an employee who makes more than $140,001 pays $465 per month for the same plan. For retirement, the College automatically contributes 10.12 percent to each employee’s 401(a) Plan, or 12.13 percent if the employee is over the age of 50. Spending on retirement and other benefits, including tuition assistance and contributions to the Social Security Wage Base, totaled $15.4 million for 2018-2019. After payroll, the remaining 35.4 percent of the operating budget for fiscal year (FY) 2018-2019—approximately $59.3 million—is used to pay for the College’s operations. These expenses are the things (not people) that the College spends money on, including everything from software and library materials to travel and brochures for admissions recruiting. Auxiliary enterprises, which generate revenue by providing services to the Brunswick community, constitute the largest category of operating expenses in this year’s budget, accounting for about 15 percent of all operational expenses. This spending goes toward the Bowdoin Store, the shop at the Museum of Art and the Children’s Center, among others. Information Technology and Academic Affairs are the categories that receive the second- and third-most funding respectively. Some operational expenses tend to stay relatively the same year after year. The cost of insurance, for example, is the same this year as it was last year. Other expenses are more subject to changes that the College cannot control; for instance, the cost of academic journal subscriptions continues to increase. 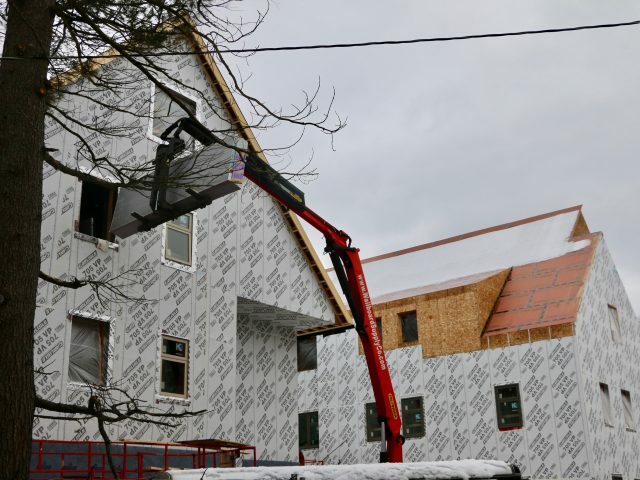 Around $5.8 million (3.4 percent) of the operating budget is spent on major maintenance and capital renewal, which includes repairs, replacements and maintenance—projects such as the replacement of floors or the ongoing renovations to Brunswick Apartments. While spending on maintenance and capital renewal projects comes from the operating budget, large projects and maintenance that cost more than $500,000 come from the capital budget—a different budget altogether. The capital budget, unlike the operating budget, is intended for one-time projects, such as building the Roux Center for the Environment and Park Row Apartments. Unlike the operating budget, which draws money primarily from tuition and the endowment, the capital budget can be financed through donations or debt. This fiscal year the College anticipates spending between $35-40 million on capital projects such as the renovation of Boody-Johnson House. This expenditure is part of the College’s $153 million capital plan that spans from FY 2017 to FY 2022. What’s not in the budget? A few of the College’s yearly expenses don’t show up on the balance sheet. The investment office, which has nine employees, is funded out of its own returns. Financial aid, which is roughly $41.6 million this year, also isn’t included in the $168 million operating budget. That’s because the College, rather than giving students money that they would then use to pay tuition, doesn’t collect full tuition payments from students on financial aid. The College spends $92,315 per student each year, calculated by dividing the current operating budget by the number of students on campus. 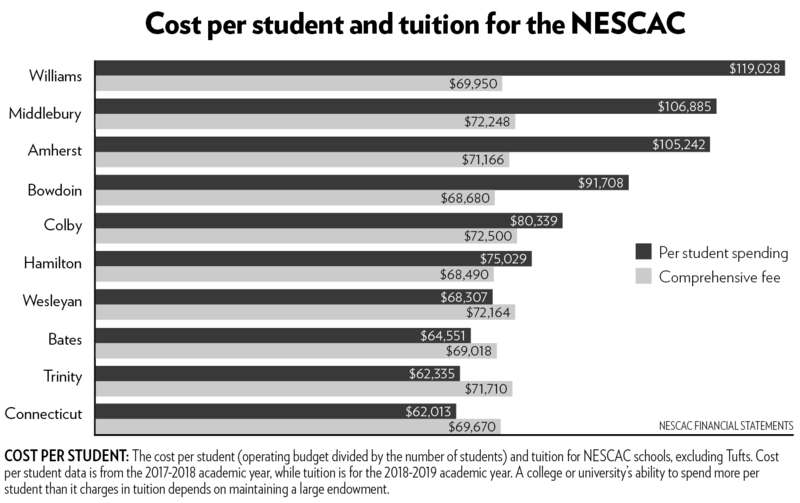 This figure puts Bowdoin in the middle of the pack among NESCAC schools. Spending per student is generally correlated with endowment size (Bowdoin’s endowment is $1.63 billion). For example, Bates (with an endowment of roughly $300 million) spends roughly $65,000 per student, and Williams (with an endowment of roughly $2.7 billion) spends roughly $119,000 per student. A budget, of course, is the amount of money the College plans to spend. What would happen if its expenses are higher than expected? For instance, Bowdoin touts its need-blind admissions process and its commitment to meeting students’ full demonstrated need. But this also means that it is impossible to predict the exact amount of financial aid necessary in order to fund every student’s education—and therefore the amount of tuition dollars the College will receive. Similarly, healthcare claims could be higher than normal, putting Bowdoin over budget. The College hopes that, if expenditures were higher than expected in one area, they might happen to be lower than expected in another. But in the event of a deficit, Bowdoin has a reserve of roughly $15 million, derived from past budget surpluses, that it can draw from if the planned budget does not adequately cover the College’s yearly expenses. Bowdoin’s operating budget for this academic year was 3.4 percent higher than it was last year, and it will likely continue to grow. The College regularly fields suggestions from faculty, staff, students, the larger community and even the federal government about how it should spend its money. But for now, its plan is set. “Whenever you break the mold and you do something different or you stand for something, you’re going to get pushback. 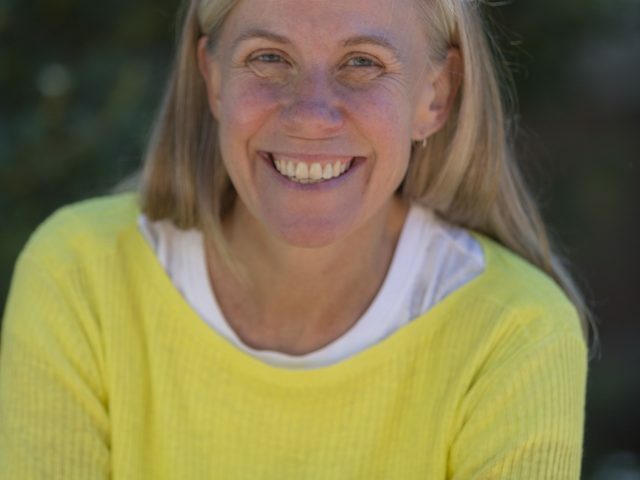 You’re going to get people who want to shun you and shut you out,” said Sophia Nelson during a moderated discussion with Assistant Professor of Government Chryl Laird in Kresge Auditorium on Tuesday evening. On Wednesday, students filled the chairs of Jack Magee’s Pub and Grill to watch the annual Bowdoin Student Government (BSG) election debates. Moderated by the Orient’s editors-in-chief Calder McHugh ’19 and Jessica Piper ’19, the debates gave students the opportunity to get to know the candidates for next year’s BSG executive team and hear their proposed platforms.